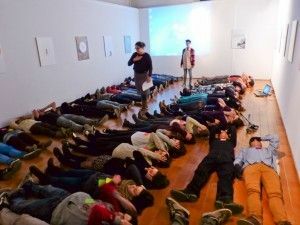 A project promoted by ACVic Centre d’Arts Contemporànies in conjunction with Escola d'Art i Superior de Disseny de Vic, as part of the international "Adobe Youth Voices" programme and with the participation of Les Salonnières. This project is part of Hibridacions i Contextos A collaborative programme between arts centres and art schools around Catalonia. The workshop initiated several audiovisual projects, through training programmes on image processing and video editing. Technical education was combined with learning skills in conceptualisation, thematic development, task management, and in how to structure working teams. During this process, a series of multimedia presentations were made on a number of social issues, proposed in accordance with the visions of young participants aged between 16 and 18. Issues such as work, wishes, the future, insecurity, prejudice, roles, labels, routine, identity, have arisen in a series of short films using animation, fiction or experimental video. Part of the work process involved the collaboration of The Salonières, an artists' collective who use visual techniques, performance and workshops within their artistic practice. The collective participated in the development of activities which brought groups together, selected themes and focused upon social issues. In this case, art and communication serve as tools for cohesion, social protest or expression. What do we like or dislike about our surroundings? What wishes or worries would we like to express? How can we express our ideas, and how might we organise ourselves in groups to perform them? These are the key questions which have informed the various phases of the workshop. Using the experience gained, combining education and production under the title Have your say!, the young participants decided the content of their work, and brought it to a successful conclusion. Pupils have participated in the project voluntarily, out of school hours and using the school's resources.